This temporary exhibition uniquely captures the essence of walking in the Winterthur garden landscape. Its 2,500 square feet are laid out so that visitors move along organic paths. They pass around and under architectural structures, and feel as if they are walking into landscape murals. They get hints of the spaces ahead of them and surprises as they turn corners. They encounter long vistas within the exhibit and at other times find themselves in more intimate spaces. Theatrical lighting is used to cast dappled effects on the floor. Wrought iron patterns found on the grounds are subtly reproduced graphically. The overall effect is to conceptually bring a sense of the outdoors into a rectangular interior gallery space. It conveys many of the guiding principles of landscape design utilized by H.F. duPont and the influences that shaped his ideas. 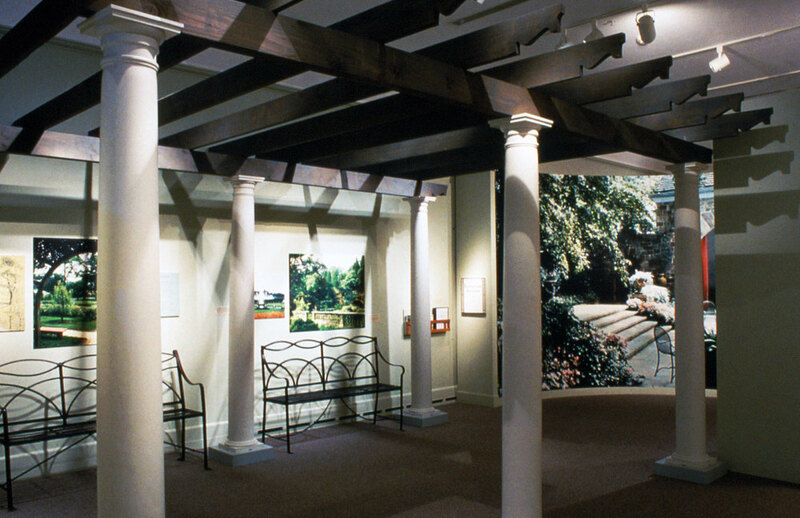 This exhibition encourages visitors to explore and enjoy the gardens. "Steve's innovative and thoughtful design traced the history of the development of the garden while making the visitor feel as if they were in the garden itself. Few exhibitions anywhere have done more to define and present the story of a particular time and place with as much concern with the visitor's experience with an exhibition as Romancing the Land."